Police in Derry have welcomed an incident-free night in the Bogside and Fountain areas of the city following almost a week of nightly violence. There were no reports of disturbances overnight following on from a major anti-violence rally held last night in the area and attended by hundreds of local people, political leaders and clergy. PSNI Chief Inspector Alan Hutton said: “I am pleased to say that the disorder we have seen on our streets in recent nights did not return last night. “I would like to thank all those who have given their support to the end of the violence in our city, and I hope that we can all move forward from this point to a continued return to normality. Chf. 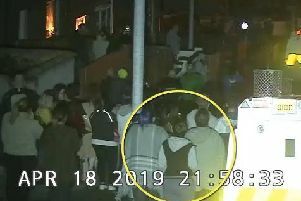 Inspector Hutton said that a 17 year old male was arrested last night, on suspicion of possessing petrol bombs in suspicious circumstances, throwing a petrol bomb and riotous behaviour and he is currently in custody “assisting us with our enquiries”.